"Business Models for Collective Governance"
Preparation of business models for collective governance. Information and communications technology based operations. We have prepared investment models that are ready for funding negotiation, which our partners may adopt. This approach sets us apart from the mainstream international development consulting firms who provide services in compliance with the requirements of international development organizations and governments. The corporate vision of Global Green is "Globalization, Green environment, good Governance, and progressive socio-economic Growth focused on human progress are the four main pillars of modern development." Global Green is a corporation registered in the State of New York, USA and its main business interest is to render the best professional services in line with the application of science and technology for socio-economic development; guided by sound development philosophies on globalization, green environment, good governance, and growth-focused development. 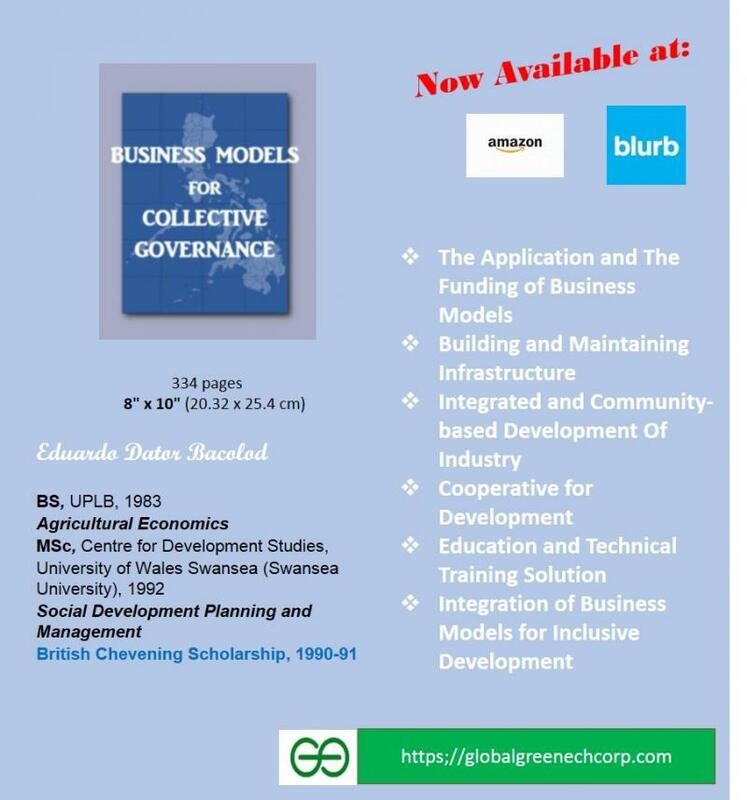 We are now looking for interested parties who are willing to collaborate with us in the publication of the Business Models for Collective Governance Book Series for other countries. We are also in the process of the development of Training Program in line with business model development and collective governance capacity enhancement. Please send your inquiry to edb@globalgreentechcorp.com. 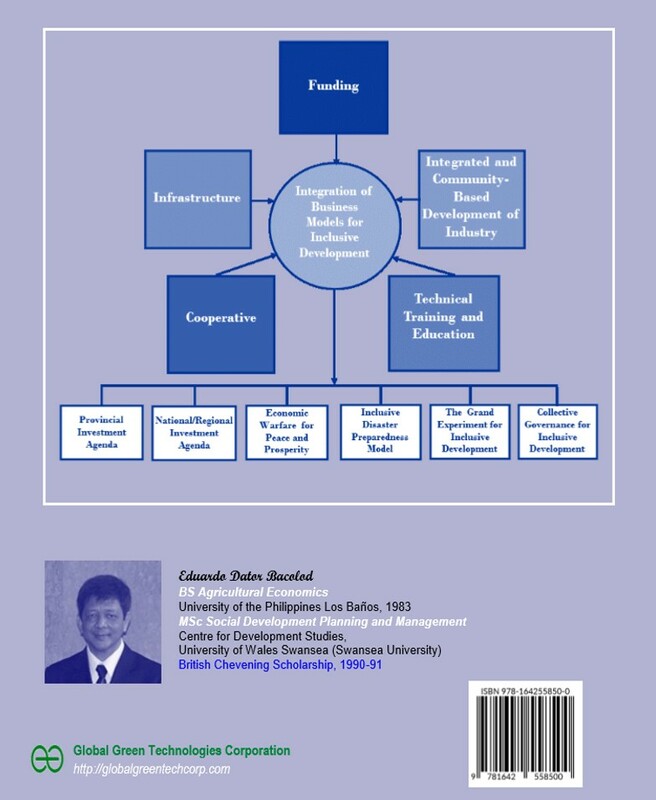 The Business Models for Collective Governance is the first of an international book writing series that crafts business models for national development planning in the developing countries of the world. The first publication is for the Philippines. This book has a special mission. It guides in building the structures and in installing the orders for the collective governance platform. It demonstrates the contents and the structures of the business models that serve as the building blocks of inclusive development enterprises. This compendium of business models for the Philippines is divided into six parts. Part I defines what is a business model; and demonstrates how it is applied in the private and the public organizations and provides alternative funding solutions, which include the establishment of rural infrastructure investment fund, translating foreign aid as foreign investment, and the reliable "Swiss private banker." These funding models, however, provide the mechanisms for leveraging the traditional international financing facilities that are available. Part II presents business models that build and maintain infrastructure vital to national development. Part III presents business models that follow the integrated community-based development process for specific industries in the Philippines. Part IV demonstrates the role of cooperatives in national development by setting up a national cooperative modernization direction focused on the crafting of cooperative business models. 32 The Philippine Studies Center in the U.S.